For the first time, a driver of an open-cockpit motorcycle has gone faster than 300 mph, thanks to a turbocharged Hayabusa engine and titanium guts. 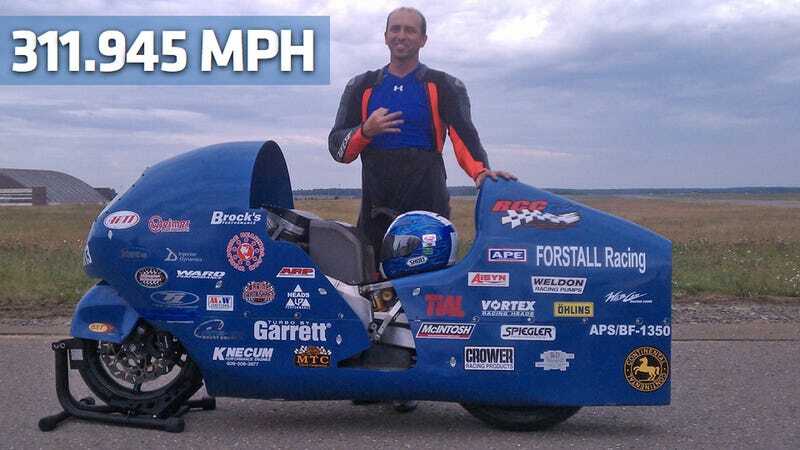 Bill Warner passed the mark Sunday, beating his own best of 278.6 mph like it was a broken Vespa. Using an abandoned runway at a former Air Force base in Maine, Warner pushed his turbocharged Hayabusa to a new world record of 311.945 mph for a vehicle with two wheels and an open cockpit. While the bodywork has been shaped for aerodynamics, the Hayabusa's frame is mostly stock. The 1299cc engine grabs power from a massive Garrett turbocharger and has no cooling system; it runs for 25 seconds, then shuts down. At 300 mph, the tires are moving at twice their speed rating. Warner told the Bangor Daily News that getting to 311 mph wasn't nearly as hard as slowing down; he didn't mention that his front fender broke near the fastest point of his run. "It was a little scary." May the world never see whatever exists that can scare Bill Warner a lot.